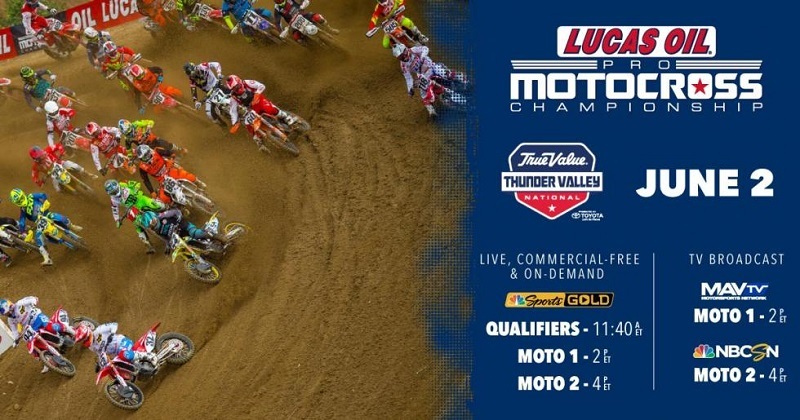 After two weeks in California, the Lucas Oil Pro Motocross Championships heads to Lakewood, Colorado for Round 3 of the season, the True Value Thunder Valley National. Whether you prefer to watch online or through your television, here’s a rundown on how to see all the action from Thunder Valley. For the second straight season, NBC Sports Gold will provide the live streaming for all 12 rounds of the Lucas Oil Pro Motocross Championship. Every single moto can be seen live and commercial-free for subscribers who purchase the Pro Motocross Pass, and each race will be available on-demand for subscribers to watch later. Exclusive to NBC Sports Gold will be live coverage of qualifiers – specifically, the second practice sessions for the 450 A and 250 A groups – at each round. NBC Sports Gold is available to residents of the following countries: the United States, the United Kingdom, Germany, Sweden, Canada, Ireland, Denmark, Switzerland, the Netherlands, Austria, Spain, Italy, Luxembourg and Japan. For American fans, television coverage of all 12 rounds can be found on MAVTV and the networks of NBC. MAVTV will show the first motos in each class live each week, while NBCSN will typically have coverage of the second motos. The U.S. television schedule for Thunder Valley is below. For fans outside the U.S. who don’t have access to NBC Sports Gold, the Nationals will be simulcast to various countries across the globe. Check your local TV listings for the time and network in your area.